We've been in the Halloween spirit in this house for over a month now. We've read lots of Halloween books, put up fun decorations, decided on Halloween costumes and bought all of our food allergy friendly Halloween candy. I debated giving out little toys or trinkets instead, but I'm still going with candy this year just like I did last year. I feel like Little Guy avoids so many foods with his allergies. He should still have the FUN experience of handing out food allergy-safe candy and getting a pumpkin full of it this Halloween! I may change my tune in future years, but for now this is the plan....a plan for FUN. Here are our 5 favorite ways we're having fun this Halloween. 1. Handing out allergy-friendly candy and preparing little guy's pumpkin filled with candy. Here are some of my current favorites. Most are lollipops or gummy candy, but all are nut-free, dairy-free, egg-free, wheat-free and sesame-free Halloween candy for Little Guy. We'll switch his pumpkin when he comes home to give him the pumpkin filled with safe candy. I still need to add some Enjoy Life Chocolate Bars in there before Halloween! 2. 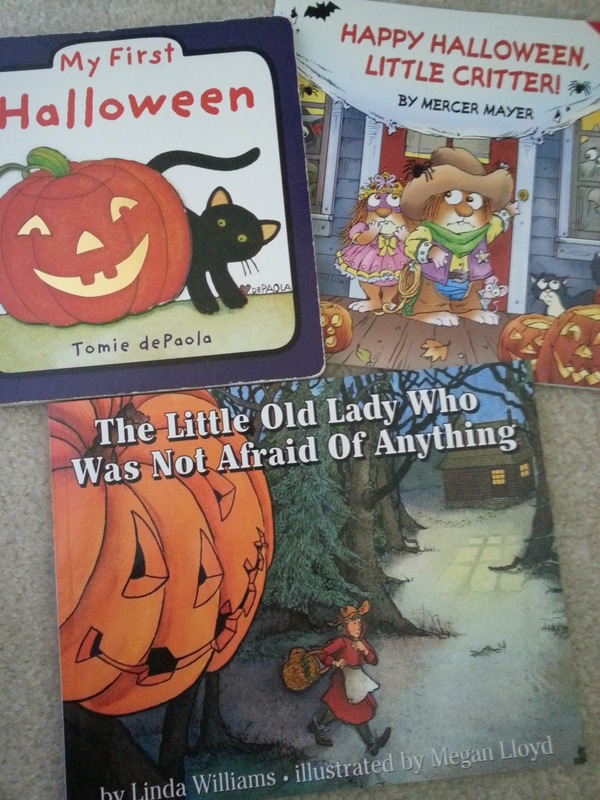 Reading fun Halloween books. 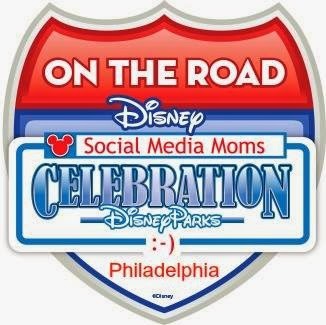 Here are 3 of our current favorites! All great for both a 1 and 3 year old in some way or another! 3. Making fun Halloween-themed food. This is something I saw on Pinterest which you may have seen too somewhere on the interweb ;) The original photo used whole peeled clementines for the pumpkins, but I made mandarin oranges work for us. Especially since Little Gal is currently obsessed with them! Little Guy loved having Enjoy Life Chocolate Chips on his half a banana that morning too. We've also had fun making our Pumpkin Bake Oatmeal Bites and Healthy Green Ghostbuster Smoothies these past few weeks. 4. Doing something "fall-ish" every weekend. 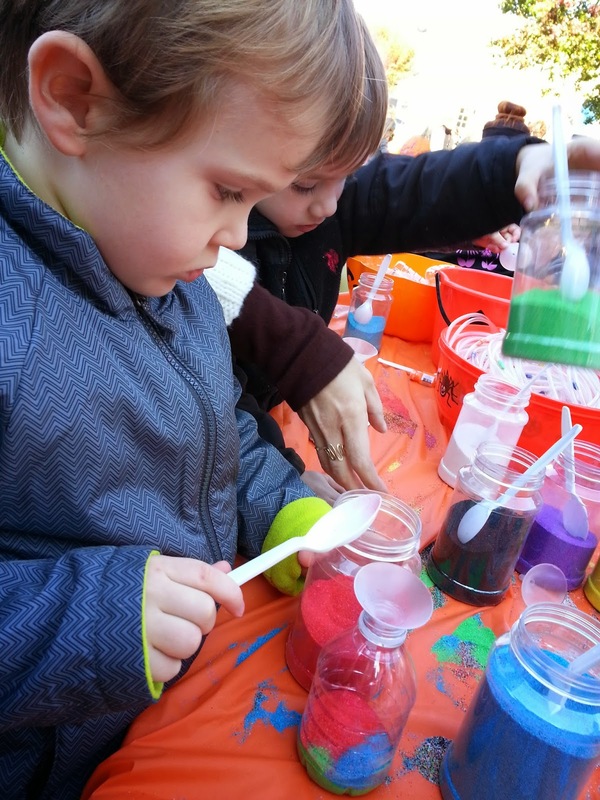 We are loving the beautiful fall weather we've had throughout September and October here in the Philadelphia area. We've made at least 5 trips to various farms in the area to pick apples, run through hay mazes and pick pumpkins. We're trying to take advantage of the fun fall activities while we can. 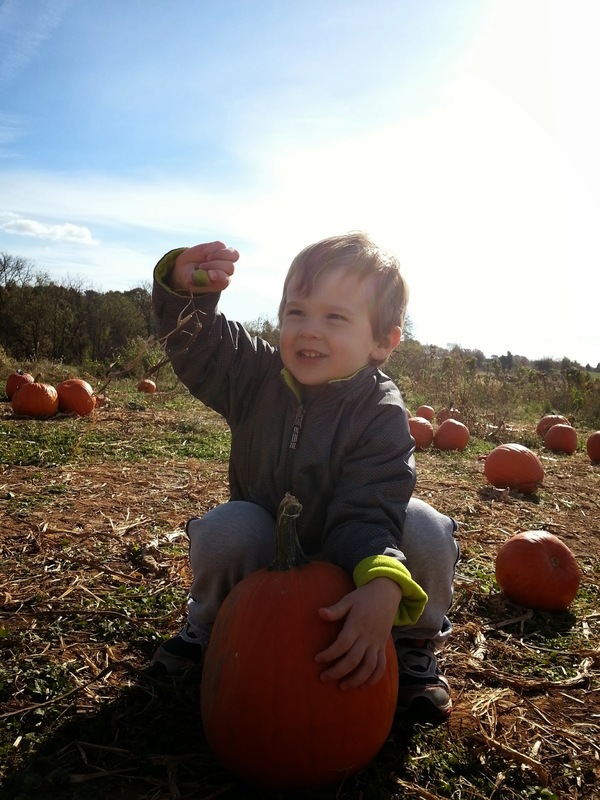 This weekend we took a hayride and picked pumpkins at a local farm with Grammy. Here's Little Guy with a miniature pumpkin he found. We made Halloween sand art at a local pumpkin fest this weekend and Grandma also helped Little Guy make trash bag ghosts for the tree in the front of our house. That's just scratching the surface of the Halloween kid craft ideas! Finally, I wanted to share a useful Halloween tip-sheet with you. 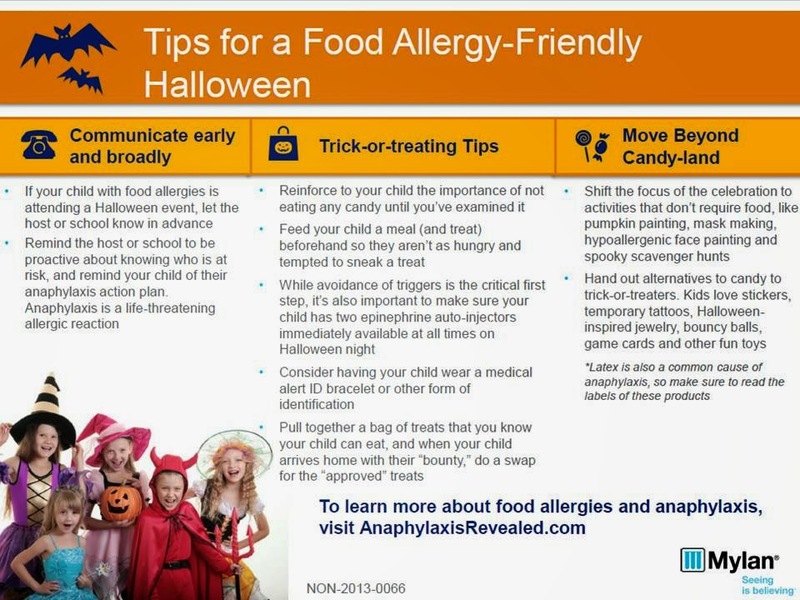 Representatives from Mylan (the makers of Epipen) sent me this great tip-sheet for a food allergy-friendly Halloween. Jo Frost, AKA "Supernanny" (who we've definitely appreciated in the past for her sleep tips! ), has been managing her own severe allergies to all nuts and shellfish since she was a child. She's working with Mylan to share some great tips to help families with food allergies celebrate Halloween. Hope you find this useful! What kind of "goodies" are you giving out this year? 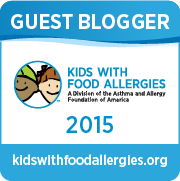 Any allergy-friendly favorites? Thanks Diane! We're excited for the costumes too!